There were quite a few recent milestones, high and low, noted in the Quarter 2 Residential Property Loan Origination Report from ATTOM Data Solutions. The report covers the 2.09 million 1 to 4 unit residential loans originated during the quarter, an increase of 15 percent from the first quarter but only 1 percent more than a year earlier. One striking finding was the increase in the size of downpayments during the quarter - a median of $19,900, a record high in data going back to the first quarter of 2000. This is a 19 percent increase from $16,750 in the previous quarter and 18 percent from $16,925 in the same quarter last year. At a percentage, that represents 7.6 percent of the median sales price of the homes purchased with a mortgage during the quarter, compared to 6.6 percent in both of the two earlier periods. This is the highest median percentage down in nearly 15 years. The number of loans with co-buyers, that is multiple, non-married buyers listed on the sales deed, also increased and those loans had average downpayments 51 percent higher than loans without co-buyers, $63,117 versus $41,749. Downpayments on co-buyer loans represented 16.3 percent of the purchase price, more than double the average percentage for other homebuyers of 8.1 percent. Nationwide 17.6 percent of all single family home purchases in Q2 were to co-buyers, up from 17.4 percent in the previous quarter. No surprise that loans for refinancing were down 1 percent from the previous quarter and 2 percent year-over-year to the lowest level since the first quarter of 2014. Those originations totaled just under 800,000. The number of purchase loans jumped 39 percent compared to Q1, to 926,516 and were up 1 percent year-over-year. Home equity lines of credit (HELOCS) were originated at the highest level since the third quarter of 2008. The total of 361,845 was a 4 percent increase from the previous quarter and a 2 percent improvement over a year ago. "Rising mortgage rates are continuing to cool demand for refinance originations, which were down to their lowest level since 2014 - the last time we saw more than six consecutive months with average 30-year fixed mortgage rates above 4 percent," said Daren Blomquist, senior vice president at ATTOM Data Solutions. "Meanwhile buyers are upping the ante when it comes to down payments, evidenced by the record-high median down payment for homes purchased in the quarter, and an increasing number of buyers are getting help from co-buyers." The ATTOM report is derived from publicly recorded mortgages and deeds of trust in more than 1,700 counties accounting for more than 87 percent of the U.S. population. Counts and dollar volumes for the two most recent quarters are projected based on available data at the time of the report. Residential loans backed by the Federal Housing Administration (FHA) accounted for 10.2 percent of all residential property loans originated in Q2 2018, down from 10.9 percent in the previous quarter and down from 13.5 percent a year ago to a more than 10-year low. VA loans accounted for 5.4 percent of the total, down from 6.2 percent in the previous quarter and 6.4 percent a year ago. Refinancing declined year-over year in 99 of the 173 metropolitan statistical areas (MSAs) analyzed in the report including Los Angeles (down 13 percent), Chicago (5 percent) Philadelphia (9 percent); Washington, D.C. (21 percent); and Atlanta (12 percent). Among the 74 MSAs where refinancing increased were New York (up 17 percent), Dallas-Fort Worth (15 percent), Houston (69 percent); Miami (31 percent); and Boston (23 percent). 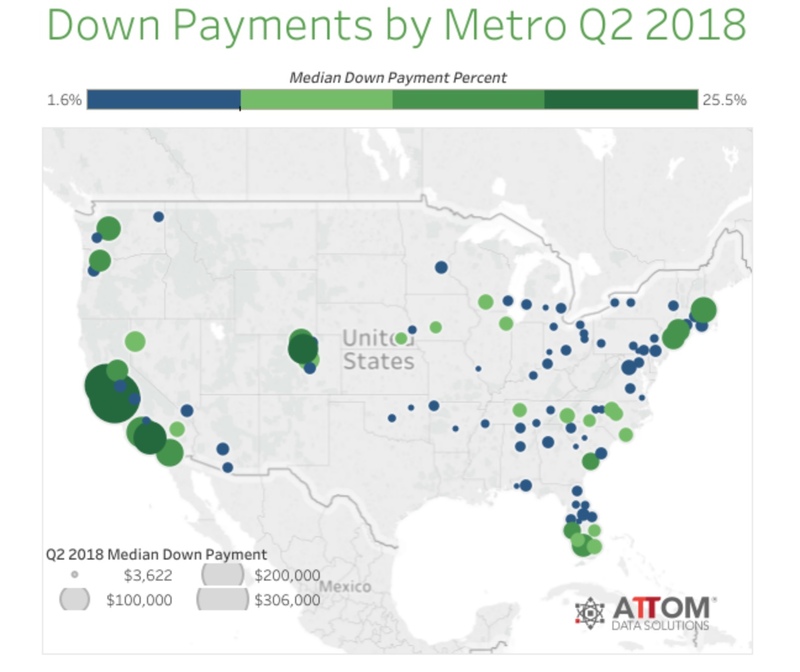 Among the 103 MSAs in which downpayments were analyzed, it is not surprising that four of the five with the highest were high priced California cities. San Jose topped the list with a median of $305,000, followed by San Francisco, Los Angeles, and Oxnard-Thousand Oaks at $114,300. The fifth highest was Boulder, Colorado at $107,750. Many of these were also the areas with the highest share of co-buyers, with San Jose also topping this list at 49.3 percent. San Francisco, Honolulu, Seattle, and Miami made up the remainder of the top five.